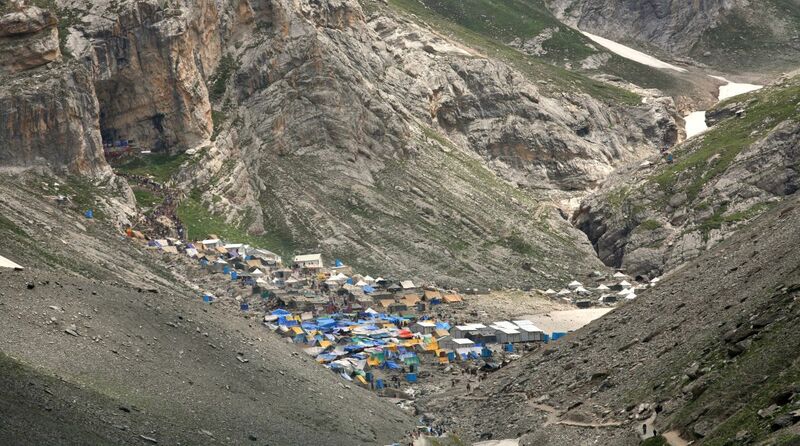 The Valley these days is humming with pilgrims heading towards the Amarnath shrine on the Himalayas in South Kashmir. The tourist spots of Pahalgam and Baltal (Sonamarg), which are the base camps for the pilgrimage, did not have many tourists this season but are now bustling with the footfall of pilgrims. The two-month-long pilgrimage began on 28 June with the looming threat of terrorism but the weather played spoilsport as only 1007 pilgrims could make it to the cave shrine to perform pooja of the ice-lingam on the first day. It will conclude of 26 August on the day of Raksha Bandhan. Keeping in view the heightened incidents of terrorism in South Kashmir, the authorities had to make unprecedented security arrangements for the safety of the pilgrims. Radio Frequency Identification Device (RFID) was put on each vehicle carrying pilgrims so as to monitor their movement. Motorbike escorts of the CRPF were carrying cameras fitted on their helmets to enable the authorities to monitor live movement of the convoys. This is the first time that the security agencies are keeping an eye on movement of the pilgrims through drones. It is also the first time that the Defence Minister, Army chief and top brass of the security forces are personally monitoring the pilgrimage. More than 25,000 men of the Army, CRPF, BSF, ITBP, J&K Police, NDRF and SDRF are deployed on the pilgrimage route. The highway between Pathankot in Punjab and Jammu is also being kept under tight vigil of the security forces. The helicopter service to the shrine from both base camps has become a favourite as more than 12,000 pilgrims have booked their seats in advance. The per passenger one way fare for a helicopter ride is Rs1600 for the Baltal route and Rs 2751 for the Pahalgam route. The worsening situation in the valley has over the years also reduced the number of pilgrims as terrorists have attacked the pilgrims from time to time. About 2.12 lakh pilgrims have so far registered for the current yatra against 6.34 lakh in 2011. The number of pilgrims declined to 6.22 lakh in 2012 and 3.50 lakh in 2013. The Harkat-ul-Mujahideen terrorist outfit had in 1994 called for banning the pilgrimage that remained muted in 2016 during widespread violence in Kashmir. It is arduous for the security forces to keep constant vigil on the two routes to the 12,756 high cave shrine. The cave is surrounded by snow clad mountains. Though lengthier, the Pahalgam route is scenic and passes through the holy Sheshnag Lake. The other route through Baltal is shorter but tiring as it has been a trek training route of the Army. Governor NN Vohra, who is also chairman of the Shri Amarnath Shrine Board (SASB), has made several trips to Pahalgam and Baltal routes to personally take stock of the security and other arrangements. He held a series of meetings of the SASB in which it was decided to restrict the number of pilgrims on both routes to 7500. Advance booking for the pilgrimage is being done through 437 branches of various banks across the country. The National Green Tribunal (NGT) had recently asked the SASB to take steps to preserve the environs of the pilgrimage routes and the base camps.